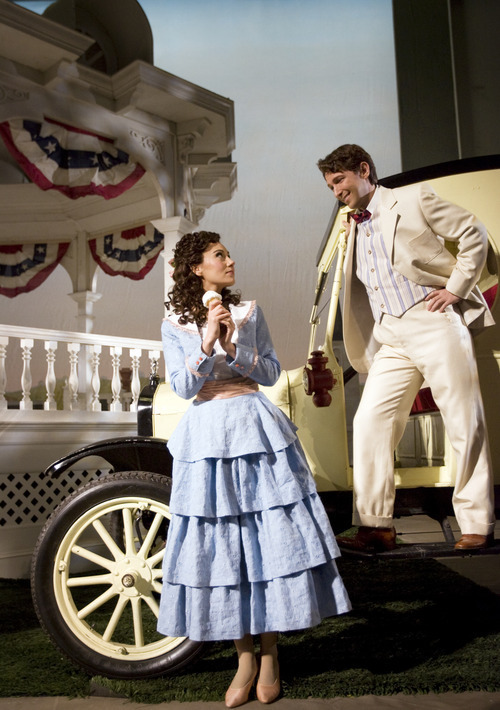 Review • Utah Opera production boasts a lovable cast and effervescent score. Kim Raff | The Salt Lake Tribune (left) Anya Matanovic, playing Adina, (right) Aaron Blake, playing Nemorino pose during a preview for Utah Opera's production of "The Elixir of Love" at the Capitol Theatre in Salt Lake City. 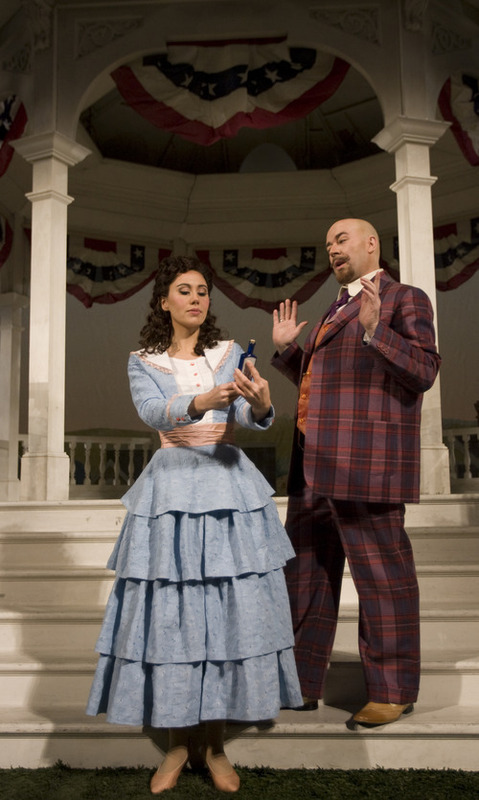 Kim Raff | The Salt Lake Tribune (left) Anya Matanovic, playing Adina, and Rod Nelman, playing Dulcamara, pose during a preview for Utah Opera's production of "The Elixir of Love" at the Capitol Theatre in Salt Lake City. 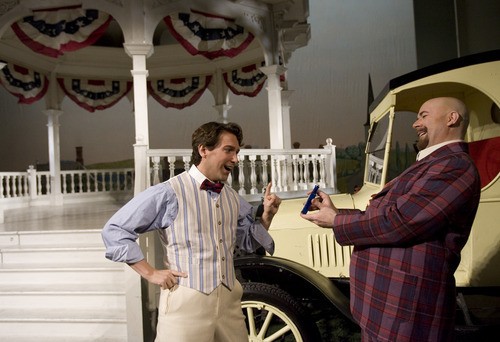 Kim Raff | The Salt Lake Tribune (left) Aaron Blake, playing Nemorino and (right) Rod Nelman, playing Dulcamara, pose during a preview for Utah Opera's production of "The Elixir of Love" at the Capitol Theatre in Salt Lake City. 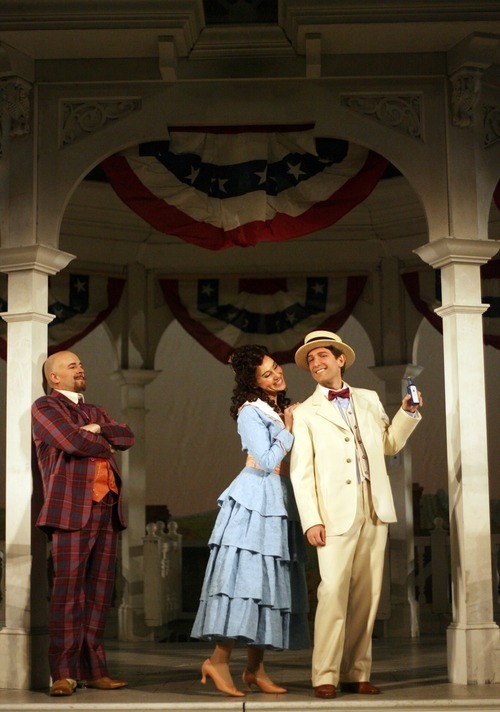 Kim Raff | The Salt Lake Tribune (middle) Anya Matanovic, playing Adina, (right) Aaron Blake, playing Nemorino and (left) Rod Nelman, playing Dulcamara, pose during a preview for Utah Opera's production of "The Elixir of Love" at the Capitol Theatre in Salt Lake City. 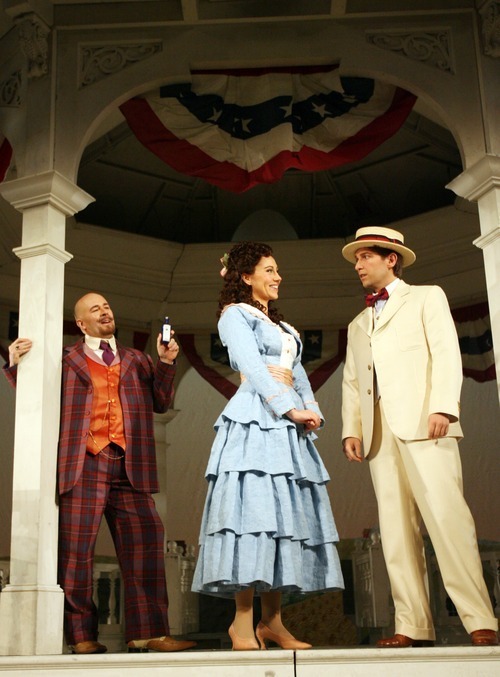 Kim Raff | The Salt Lake Tribune (middle) Anya Matanovic, playing Adina, (right) Aaron Blake, playing Nemorino and (left) Rod Nelman, playing Dulcamara, pose during a preview for Utah Opera's production of "The Elixir of Love" at the Capitol Theatre in Salt Lake City. Kim Raff | The Salt Lake Tribune (middle) Anya Matanovic, playing Adina, (right) Aaron Blake, playing Nemorino and (left) Rod Nelman, playing Dulcamara, pose during a preview for Utah Opera's production of "The Elixir of Love" at the Capitol Theatre in Salt Lake City. Kim Raff | The Salt Lake Tribune (left) Anya Matanovic, playing Adina, (right) Aaron Blake, playing Nemorino pose during a preview for Utah Opera's production of "The Elixir of Love" at the Capitol Theatre in Salt Lake City. Kim Raff | The Salt Lake Tribune (left) Anya Matanovic, playing Adina, (right) Aaron Blake, playing Nemorino pose during a preview for Utah Opera's production of "The Elixir of Love" at the Capitol Theatre in Salt Lake City. Kim Raff | The Salt Lake Tribune (left) Anya Matanovic, playing Adina, (right) Aaron Blake, playing Nemorino pose during a preview for Utah Opera's production of "The Elixir of Love" at the Capitol Theatre in Salt Lake City. 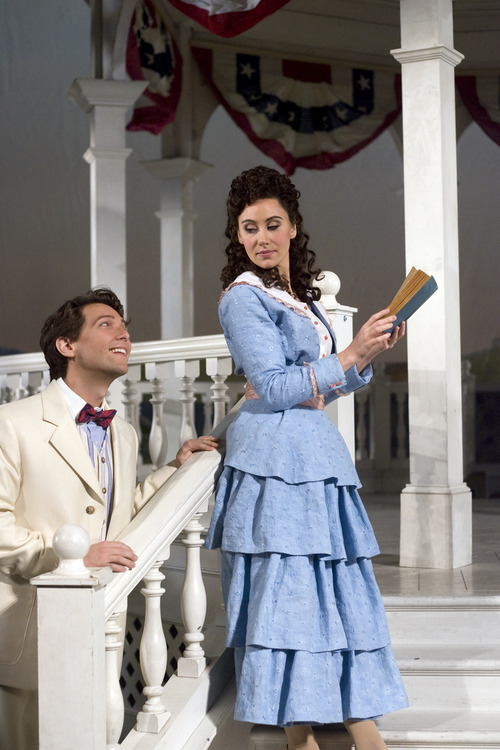 Kim Raff | The Salt Lake Tribune (right) Anya Matanovic, playing Adina, (left) Aaron Blake, playing Nemorino pose during a preview for Utah Opera's production of "The Elixir of Love" at the Capitol Theatre in Salt Lake City. Kim Raff | The Salt Lake Tribune (right) Anya Matanovic, playing Adina, (left) Aaron Blake, playing Nemorino and Rod Nelman, playing Dulcamara, pose during a preview for Utah Opera's production of "The Elixir of Love" at the Capitol Theatre in Salt Lake City. 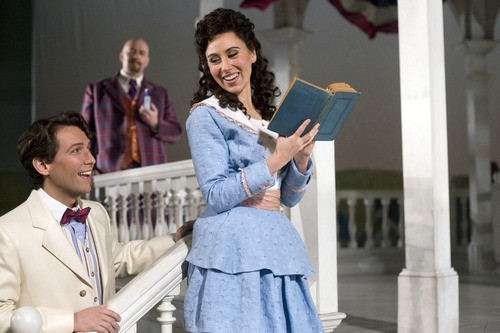 Kim Raff | The Salt Lake Tribune (right) Anya Matanovic, playing Adina, (left) Aaron Blake, playing Nemorino and Rod Nelman, playing Dulcamara, pose during a preview for Utah Opera's production of "The Elixir of Love" at the Capitol Theatre in Salt Lake City. Kim Raff | The Salt Lake Tribune Aaron Blake, playing Nemorino during a preview for Utah Opera's production of "The Elixir of Love" at the Capitol Theatre in Salt Lake City. Kim Raff | The Salt Lake Tribune Aaron Blake, playing Nemorino during a preview for Utah Opera's production of "The Elixir of Love" at the Capitol Theatre in Salt Lake City. Kim Raff | The Salt Lake Tribune Aaron Blake, playing Nemorino during a preview for Utah Opera's production of "The Elixir of Love" at the Capitol Theatre in Salt Lake City. "The Elixir of Love" revolves around a potion purported to make the drinker irresistible to the object of his desire. It's a potent potion indeed: Not only the protagonist Nemorino, but Utah Opera's entire production of the Gaetano Donizetti opera, is virtually irresistible. This production  conceived by James Robinson, with a Grandma Moses-inspired set design by Allen Moyer and smart-looking costumes by Alice Bristow  places the Donizetti opera in a small town in the American Midwest in the second decade of the 20th century. It was clear from the opening scene in Saturday's opening performance that everyone onstage was having fun. Stage director Crystal Manich made sure that each chorus member had a clear identity; their interactions established a strong sense of community and helped the audience warm to them right away. 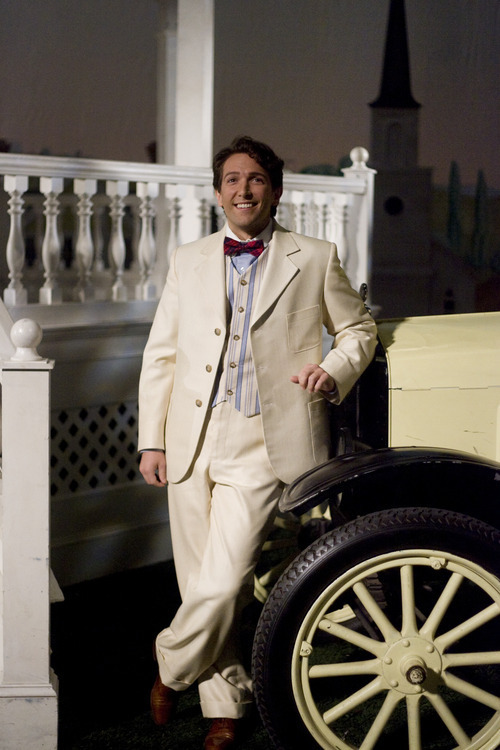 The plot revolves around Nemorino, a naive but good-natured young man who is in love with the worldwise Adina. When Adina accepts a surprising marriage proposal from another man, Nemorino must act fast. Enter the traveling salesman Dulcamara. Soprano Anya Matanovic made a most winsome Adina, with a glittering voice and abundant charm. 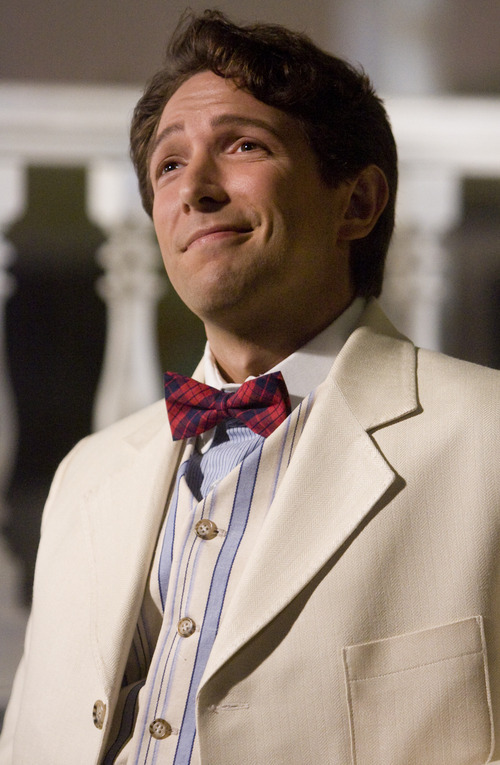 Tenor Aaron Blake, as Nemorino, was occasionally underpowered but made up for it with his stylish, expressive delivery and immense likability. Together, they had some of the best romantic chemistry seen on the Capitol Theatre stage in recent memory. But it wasn't just the romance that sparkled with great chemistry; there was engaging and believable rapport in all of the opera's numerous duets. Even the snake-oil salesman Dulcamara earned audience sympathy thanks to the powerful voice and excellent comic timing of bass Rod Nelman. 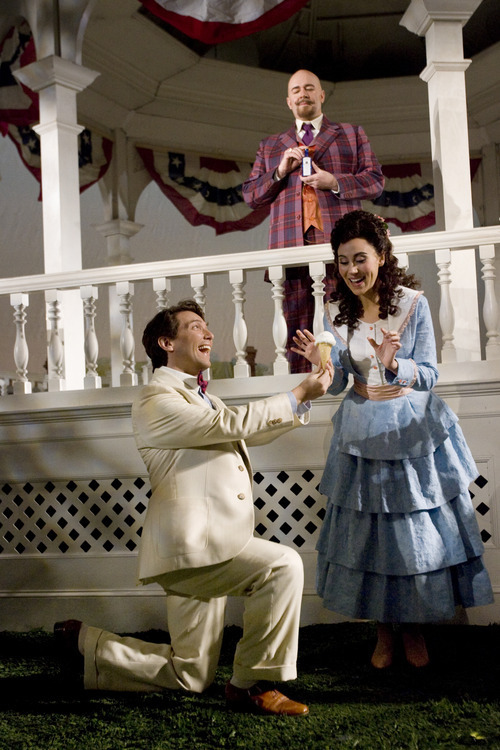 Rounding out the cast were soprano Jennie Litster, assertive and plucky as Adina's friend Giannetta, and baritone Andrew Wilkowske, who had a smaller voice but big stage presence as Adina's pompous suitor Belcore. 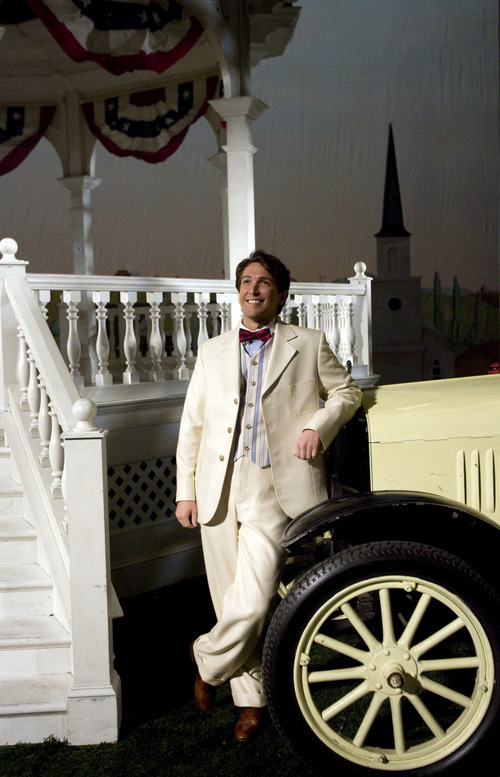 Utah Opera presents Donizetti's "The Elixir of Love." The opera is sung in Italian, with Supertitles in English. When • Reviewed Saturday, March 10; repeats Monday, Wednesday and Friday, March 12, 14 and 16, at 7:30 p.m., with a 2 p.m. matinee Sunday, March 18. Running time • Just under 2½ hours, including intermission. 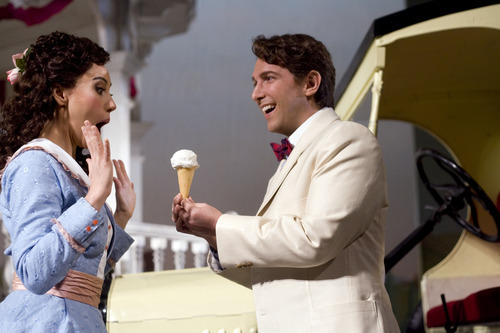 Tickets • $16 to $85 ($5 more on performance day) at http://www.utahopera.org, 801-355-ARTS or the box office.